As many are aware, momentum for climate action has recently shifted to a more local level. 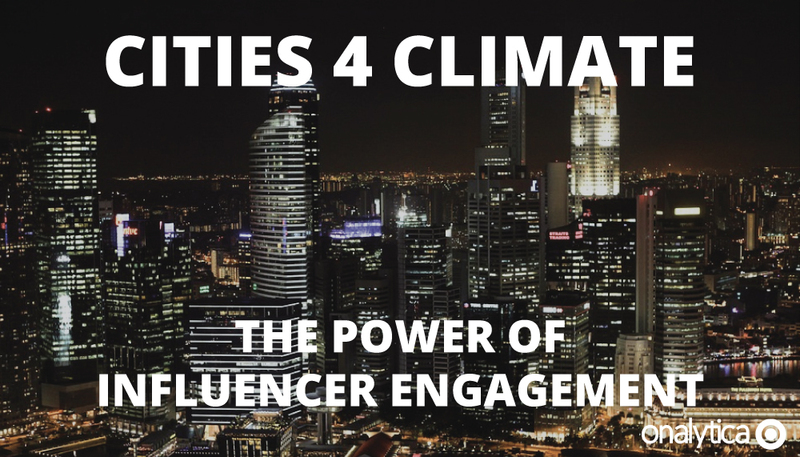 That’s why the team at Onalytica and I chose to zero in on the power and potential of Twitter influencer engagement around the #Cities4Climate tag. It is no surprise that the global C40Cities organization has lead the charge and built upon the broader conversation. And, just past the reality check of November’s U.S. election, that organization’s December 2016 conference generated a flurry of Twitter activity. Now that it seems likely the U.S. government will not follow through on their piece of the Paris Agreement, many of our cities’ Mayors, Chief Sustainability Officers and Chief Resilience Officers are heeding the call. Both in the U.S. and globally I’d argue, Twitter has the potential to be seen as a key tool. As we witnessed during COP21, tweets from key individuals (@Cfigueres, @PaulPolman) and key brands (@UNFCCC, @CDP ) raised a digital roar that influenced real-life connections and sparked conversations for the greater good. The potential for the #Cities4Climate hashtag to have a similar congregating, supporting and amplifying effect could be exponential. Let’s take a look at who is already involved and where the opportunities lie. In order to identify the social influencers and brands we started by extracting over 25Ktweets tweets from 1st November – 1st December 2016 mentioning the key words: #Cities4Climate and #C40Cities. We then added these tweets and accounts into our database, categorized and curated a top 100 list of influencers and brands ranked on a combination of the 4 R’s (Resonance, Relevance, Reach and Reference). These accounts were then added into Onalytica’s Influencer Relationship Management software (IRM). The power of a hashtag can be leveraged far beyond events or specific campaigns, which is an opportunity not yet well utilised. For example, while #climateaction built momentum around COP21 and maintained some conversation, the real substance and place for engaged influencers to gather has since built around the more specific tags. Great information and new city influencers are not only for climate action during conferences like @C40cities or @compactofmayors events. 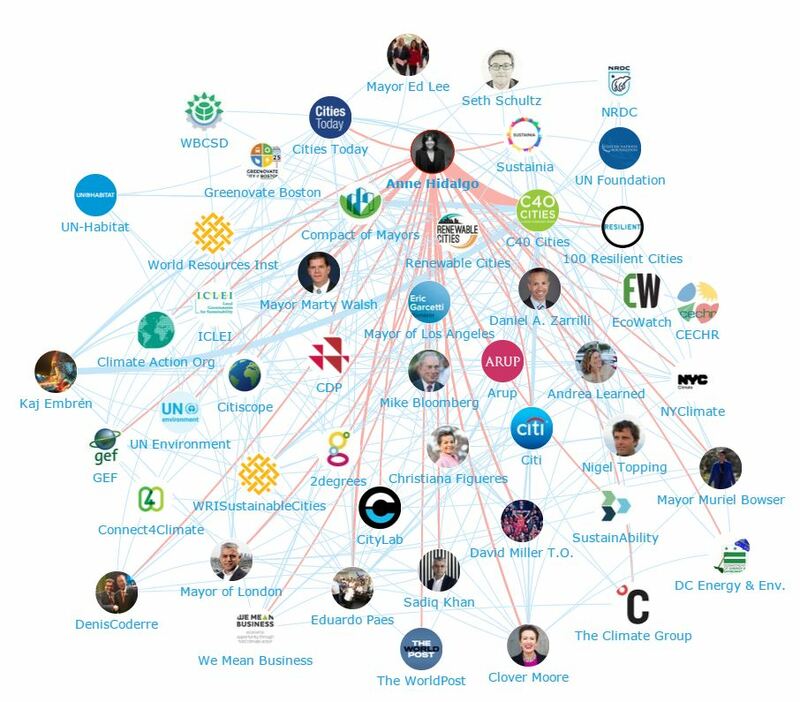 Big events help #climate4cities influencers discover one another and “start” conversations, but then the energy seems to be lost. Climate action can no longer allow for that fade in interest. Another point worth noting, the influential organizations in the climate action space are fairly obvious, and so easy to find and follow (which is a great thing). However, the power from here may be in the individual authentic engagement of key #cities4climate leaders. People like Matt Petersen, the Chief Sustainability Officer of Los Angeles, Stephanie Stuckey , the Chief Resilience Officer of Atlanta and Daniel Zarrilli, New York City’s Chief Resilience Officer are already leveraging their influence for positive, climate impact. The more a thriving Twitter ecosystem of organizations and individuals exists to “love up” and support one another’s progress in this cause, the better. Now more than ever – and again with perhaps a bit of extra emphasis on the U.S. – amplifying the entire conversation reflects the strength of the climate action cause. Building solidarity between real-time climate action events or marches will help keep us energized. 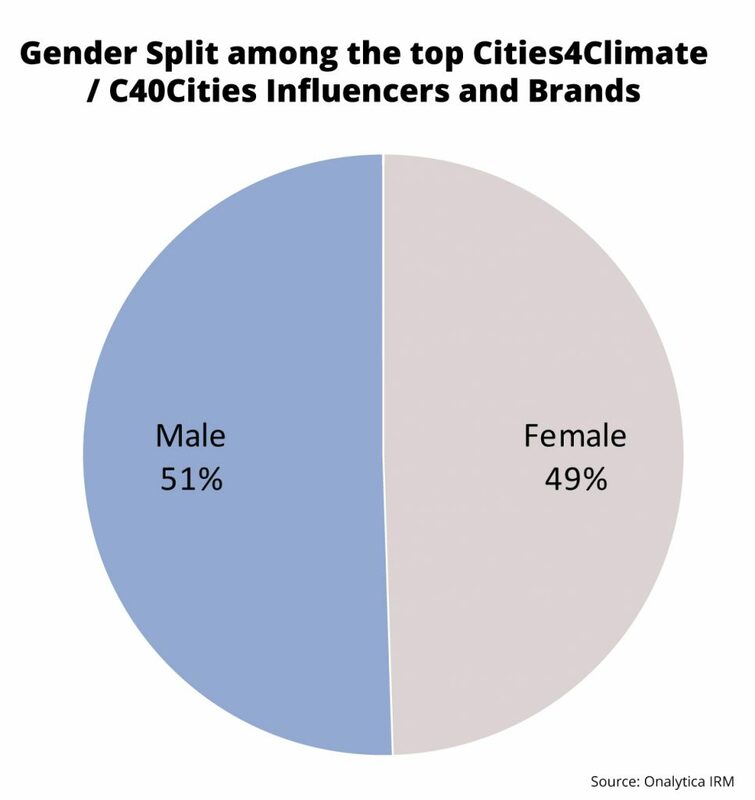 Influencer gender is quite balanced: The fact that women are already almost half of this individual influencer mix points to the extra potential of #women4climate in the #cities4climate work. As someone focused on women and the leadership potential in climate action overall, I’ll be doing more study and can keep you posted. Keep an eye out for a future blog post by Onalytica and I that looks a bit more deeply into the #women4climate tag. Good hashtags don’t have to lose impact past the event: There is great between-event opportunity for those who continue to contribute to a particular discussion tag. Those who choose to can take the lead and be very visible, while amplifying all the wisdom and information that many others may not know to tag. The work they put in (which can be fairly minor) to maintaining the tag in “quiet” times earns them greater influence when the next event comes around, for one thing. Twitter influencers hold significant power in which stories get told and shared: Despite recent evidence to the contrary, I am one who still believes that Twitter can be an incredible way to build a platform and leverage it for good. If you are a leading off-line voice in climate action, your story may not yet be reaching the broad digital audience that awaits. You are writing articles, speaking at events and doing all sorts of traditional, off-line, connecting and amplifying, so why not take it one step further for even greater climate action impact? 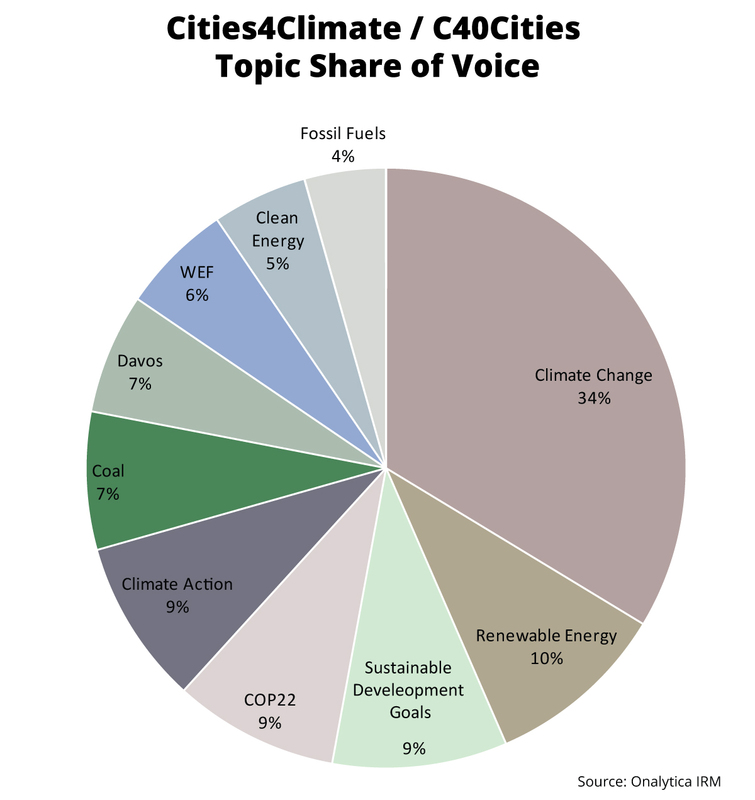 Given these lists and graphs on #cities4climate influencers, how might this activate more individuals and organizations? First, realize that simply being on the list means nothing, if you don’t use that influence for furthering the topic of your “influence” – climate action. Now is the time to add intention! If you ARE on the list, study the information and better understand how you or your organization can improve. Otherwise, commit – and do that now – to join and further the #cities4climate action-supporting information sharing. Find the individuals and organizations that curate the best, most motivating, links or wisdom and share. Post your own city’s content to add to the collective information bank and grow the social capital of #Cities4Climate. Cities focusing on climate action today must use all the tools and connections they can possibly identify to forward their missions. Don’t get stuck thinking Twitter is only a one-way digital broadcasting medium. For this particularly critical cause, the data certainly hints at much more strategic potential than that. For more insight on #cities4climate and a great discussion with Andrea Learned and Stephanie Stuckey Benfield (CRO for Atlanta), check out our podcast. Andrea Learned is a climate action-focused writer and strategic communications consultant helping business and nonprofit influencers develop authentic, high impact, leadership platforms. Andrea’s expertise in understanding the women’s market (she co-authored Don’t Think Pink, which published in 2004 ) lends her writing work – for HuffingtonPost , her own blog, and many other publications – deep insight into the potential for women, especially, in sustainability leadership roles today. 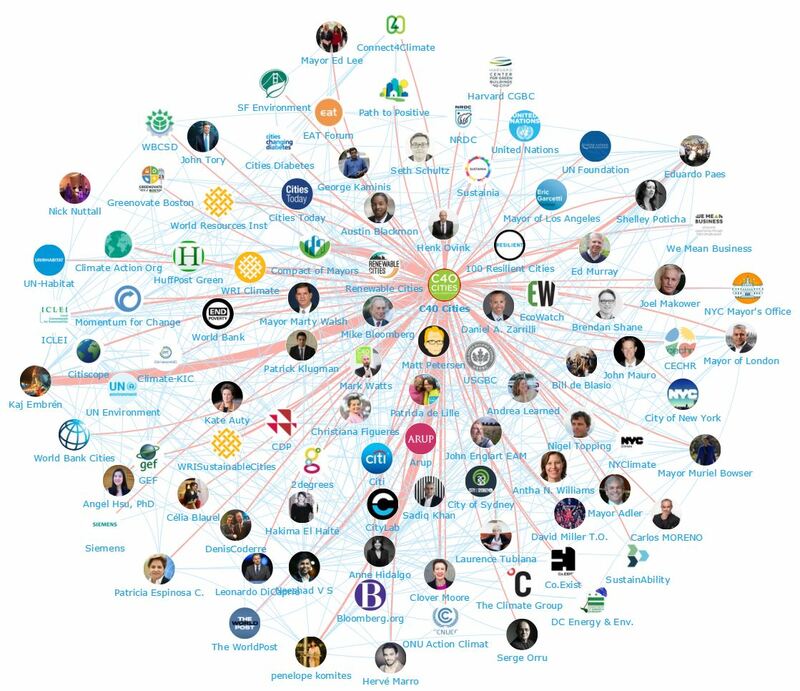 Below is a list of the top 50 influencers talking about #Cities4Climate and #C40Cities on Twitter. If you want to see who ranks from 50-100 be sure to download the full report by clicking the download button below! Here is a list of the top 50 brands talking about #Cities4Climate and #C40Cities on Twitter. If you want to see who ranks from 50-100 be sure to download the report to get the full top 100 list! Disclaimer: As ever with these lists, it must be stressed that the ranking is by no means a definitive measurement of influence, as there is no such thing. The brands and individuals listed are undoubtedly influential when it comes to driving discussion around Cities4Climate and C40Cities.